In my last article, I made a distinction between online car shopping and buying. 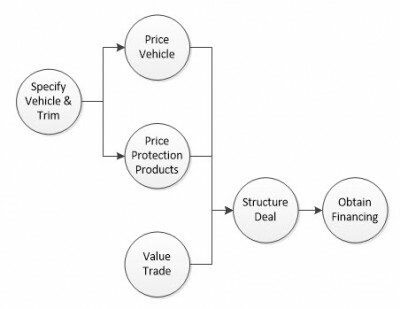 Shopping is an iterative process in which the customer settles on a vehicle, with only a rough idea of the price and terms. For many customers, this is sufficient. They will then proceed to the traditional dealer-driven process. In this article, I will present tools and techniques to support online car buying. As a software designer I feel that, fundamentally, this is something we should be able to do. If the tools exist in the dealership, then there’s no reason why they can’t be on a consumer site. This was the subtext of my earlier article, Dealer Systems in the Consumer Space. I agree that customers should visit a showroom for help in choosing a vehicle, and I agree that two-thirds of them (that’s the survey figure) will prefer to do the paperwork there. On the other hand, why shouldn’t the customer have the option to complete some or all of the paperwork at home? 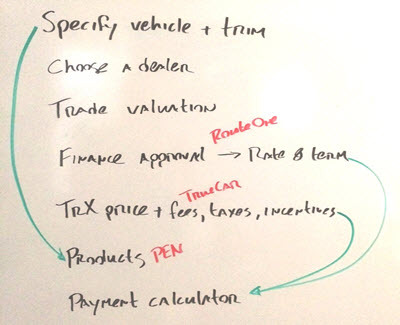 I envisage a process driven by the customer, with support from the dealership. We’ll start with a simplified process model based on task precedence, and then we’ll discuss the design requirements. I have a more detailed model based on data flows, but the precedence model is easier to work with. The flowchart below shows the required sequence of tasks, given their prerequisites. The first thing you notice about this diagram is the number of deadlocks. You can’t be certain of the finance rate until you get an approval, and you need it to structure the deal. So, the sales desk must use a floor rate or do a pre-approval. Even in the dealership, this is an inherently iterative process. Real-life business processes are never as clean as you would like. Still, I propose to streamline this one and hand it over to the consumer. Since we’re working from a precedence diagram, I’ll try to remember and discuss data requirements as we go along. The customer may search the inventory of a given dealer, all models of a given OEM, or all dealers participating in an online search platform like Auto Trader. For our purposes, AutoNation is a giant dealer site, not a platform, because they control the inventory. This is an important distinction. An OEM site may list all the vehicles they make, but must still search dealer inventories to find a specific unit. GM’s Shop-Click-Drive starts with selecting a dealer (an obvious concession to dealer pressure) whereas Chevrolet.com does a proximity search just as any platform would. This question of whose inventory to search, and when, is not so much a process decision as it is a business model decision. That’s why I left “choose a dealer” off the diagram. For example, the difference between Vroom and any other used car platform is that Vroom takes the unit into inventory. Prices and policy are set by a single entity, instead of an aggregation of competing dealers. The business context may vary, but the software requirements do not. Inventory search means model and trim selection, photos, zip code, etc. I seem to be permanently cookied in Farmington Hills, no matter whose search platform I use. In the earlier article, I discussed adding an inventory search plugin to an online lending site. All of the high level tasks in our diagram already exist as components of various web sites and dealer systems. You could conceivably deliver the entire process using service orchestration. Use no-haggle pricing. This is more practical with used cars, but new car dealers will come around eventually. Join TrueCar’s conspiracy to “destroy the industry.” What the last guy paid for his MKZ is not the dealer’s intellectual property. Do the haggling online, or by phone. For that matter, the customer can visit the dealership, take a test drive, haggle, and then go home to finish the paperwork. Remember, our objective is to make the process available to the customer online. Nothing stops her from contacting the dealership for help. Millennials are starting to express the fact that they’d like to do more shopping online. They’d like to connect that shopping to a buying experience…that needs to be quicker and more transparent. Depending on the site’s business model, there are a number of ways to handle pricing. The trick is finding one that works for the customer, without alienating the dealers. By the way, an OEM is in a much stronger position to reform pricing than TrueCar is. The quote above is from Bill Fay at Toyota. Protection products are strangely absent from the shopping sites. When you put the process into precedence terms, selling a Vehicle Service Contract jumps right to the top. As soon as the vehicle is specified, even before it’s priced, you have enough information to quote a VSC. Whatever sales approach you wish to implement – like, citing the total cost of ownership – is available early in the process. This applies to Road Hazard, Maintenance, and Appearance Protection, to name a few. My favorite sales tool for GAP must wait until the deal structure is known, but nothing stops you presenting the product at this stage. Whose products to present is another question. If this is an OEM site, our choice of products is fixed. Let’s design for the worst case and assume a platform with a variety of dealers. In this case, we must store a profile for each dealer, as we would for a menu system, indicating the dealer’s slate of products. Which sales approach is best for the online consumer? I’d be lying if I said I knew, because no one knows. I have some experience with menu presentation, and I am pretty sure that’s not the answer. I have also done some work with expert systems. For the purpose of this article and our Millennial online customer, I am going to recommend a passive approach. In my next article, I’ll expand on passivity as a design theme. What it means for this task is simply exposing links to the products, including information about the chosen vehicle, and allowing the customer to educate himself. Also, bear in mind that as a commerce site, you should be doing A/B testing. This question is really about navigation, and how to manage the customer’s experience. That’s where we’ll resume, next week.